Our CD duplication services are used by numerous UK business’s. Our customers are located all over the UK from Manchester, London, Birmingham, Leeds, Newcastle, Bristol and even Glasgow and Edinburgh in Scotland. Our commitment to high quality duplication and fast turnaround has brought us many loyal UK business customers who require our CD and DVD services. 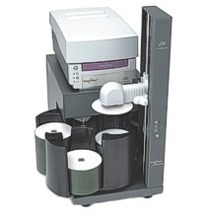 Our products range from fast duplication of CD and DVD to large volume replication and printing. We serve many advertising, marketing and blue chip corporate companies who require the top level of service and the highest quality CD and DVD printing. These days DVD or CD duplication is a far cheaper method of distributing corporate literature such as presentations, manuals, reports, sales POS and general company information. Printing and duplication of discs is now far more cost effective than printing endless paper copies and booklets and subsequently far more eco friendly for the environment. Next time you need to distribute printed material to your staff and colleagues think again, it could save you time and money by printing to disc. This entry was posted on Wednesday, December 2nd, 2009 at 4:17 pm	and is filed under CD Duplication Articles.